I spend so much time with parents and often hear how they would like a magic blue pill to make everything better. 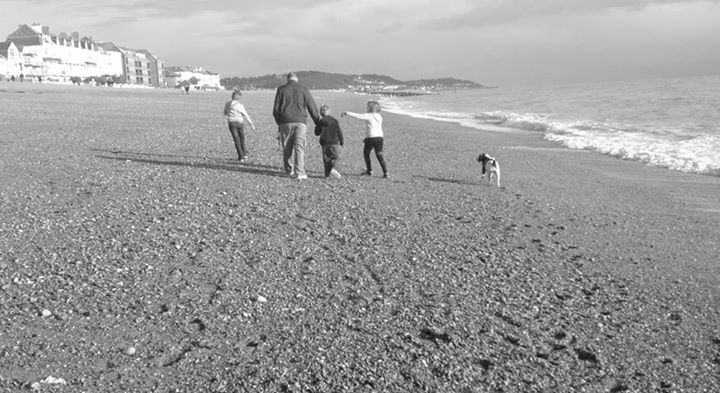 Here is a letter to my children about a magic blue pill. I would like to start with saying though that my children do not have health issues which involve many many hours, days and weeks spent in hospital – if they did, this letter would certainly be different. Over the years, you may see mummy cry with frustration, cry with exhaustion, cry with pure anger and cry at the injustice of the world but never ever think I am crying because of your disability. Your disability (or challenge as we prefer to call it) makes you who you are. If there were magic blue pills available which would “cure” your challenge, I wouldn’t give it to you as that would change the person you are. I love the way your brain works and your literal understanding. Being called “hiya” or “Debs” instead of “mummy” may make some more mummys upset but it makes me smile. Everyone says “hiya” when they meet me, so it’s understandable that you thought that was my name. And my name is “Debs” so why shouldn’t you use it when everyone else does. I love other people’s faces when you say “Debs, where’s Chris?” – I love that it doesn’t bother me. I love spending hours with you spelling all your favourite words, you amaze me with your abilities at the age of 6 to spell words that most grown ups would have to spell check. I am glad though that you have learned the use of the “space bar”, lol. Roary the racing car is much easier to read than roarytheracingcar. I love that you can recognise any make/model of car – who would have thought that sitting in traffic could be so entertaining? I love that you share your bed with over 100 matchbox cars and know where each one belongs. I have to admit I’m not so keen on this when I have to change the sheets!! I love that you expect us to respond to you in a certain manner, our answers have to be delivered your way or not at all. Frustrating when you are in a rush but it’s just part of your personality. I love that your inability to form words properly yet has not stopped you expressing yourself at length (you really are my daughter). I love that caring side of you that looks out for your brothers, kisses my head better when I say my head hurts or makes me a cup of tea with cold water, half a cup of milk and ten sugars but no teabag. I really love that you don’t sit and watch me drink it so it can discreetly be thrown away. I love watching you lick the bowl clean after baking cakes or giving us a fashion parade of your new knickers! I love that you write notes to everyone even though the only word you can write is your own name! I love that you have worked out that if Daddy is a bit cross with you, you only have to sing “Liv-er-pool” to him and kiss his cheek and suddenly you’re his number one girl again! I love that I find it hard to keep a straight face when I tell you off and you put your hands on your hips, “humph” and pout! I love you so much it hurts – or so you say all the time! I love that you love life so much. I love that you have a wider musical repertoire than most adults. How many five year olds enjoy Pink Floyd, Black Eyed Peas, JLS, Cypress Hill, Beethoven and Red Hot Chilli Peppers. I love it when you say things like “is that Chris Brown, is he a bit like Ne-Yo? I prefer Chris Brown”. I love that you get excited about which episode of Mickey Mouse is on tv today. I love that you can spin on the spot for hours without falling over, and watching new friends watch you and worry that you are going to fall. I love it that you told the Sky news camera man as he tried to get you to walk down some steps again that you were not a performing monkey – at the age of 4. I love it that you tell me off if I answer in a cross voice – when you know you’ve done nothing wrong so you know I must be cross with someone else. I love that you find so much to laugh at in life and you don’t let your lack of vision stop you doing everything you want to. So, my gorgeous children, know that I love you “so much it hurts” and I will do anything I can to ensure you have the life you deserve. Never think for one minute that your “challenge” is a disappointment to me. The only disappointment involving your “challenge” is the system supposedly there to help you have the same opportunities and respect as other children but that sadly doesn’t work. I would give that magic blue pill to the “system” today but not to you. 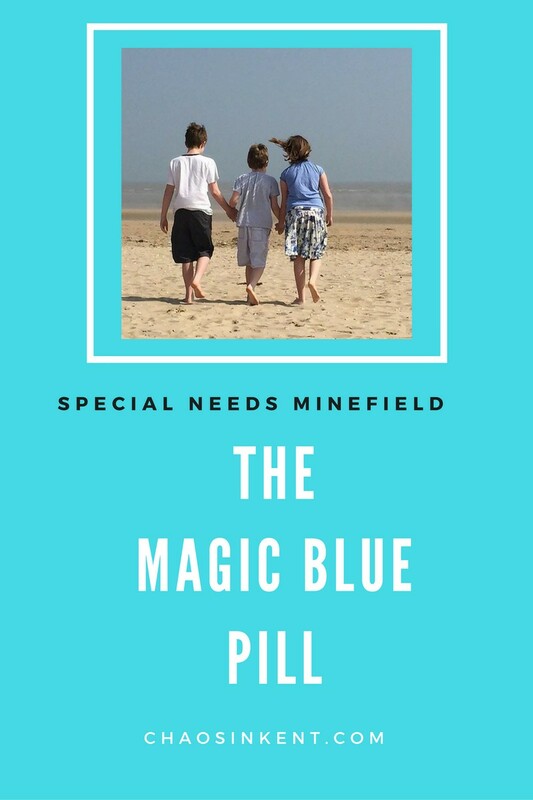 If there was a magic blue pill that made you sighted or mainstream, then it would be very arrogant of me to believe that your life would be better with sight or non-ASD. You are all happy and healthy as I write this. If, when you are older, there is a pill and you want it, then be assured that I will do everything I can do ensure you get it. As J once said “mummys can fix everything” and I want you to grow up enjoying yourselves and your childhood, safe in the knowledge that mummy is doing everything she can to fix everything for you. Beautiful (she says with black mascara streaks covering her face) heart wrenchingly beautiful! !